Super fast hot news, reviews, photos & videos - Join us on Facebook ! A clean sweep by KR and team! KR and team have won the Tamil Film Producers election that was held today by a massive margin against Thanu and party. 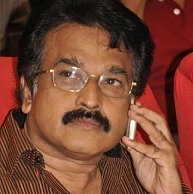 KR will assume the post of the President of the Tamil Film Producers’ Council. Studio Green’s KE Gnanavelraja and Amma Creations’ T Siva will serve as the secretaries of the council. N Subash Chandra Bose and Thyagaraja will be the vice presidents and Radhakrishnan has won the treasurer’s post. Every member of KR’s team is said to have won their posts, making it a clean sweep! Behindwoods convey its hearty congratulations to all the winners. "Vendhar Movies S. Madhan is a perfect gentleman"
Kamal Haasan misusing freedom of expression? More comedy in September ! Vanakkam Chennai release date in less than 24 hours!